Affectionately dubbed as Ireland’s ‘lake country’, Cavan has also recently emerged as an up-and-coming destination, offering a dynamic blend of traditional Irish culture with 21st century living. dominate the middle of the County. The River Boyne and Lough Sheelin Trout fishery dominate the east of the County and, to the west, the River Shannon. These lakes and rivers have good stocks of Bream, Roach, Rudd, Perch and Pike. Eels are present in all waters. Tench are widespread and have grown to specimen size in some fisheries. In recent years, Carp have been stocked into selected waters. There is a water in County Cavan to suit all tastes. Anglers seeking large open waters can choose from the wider rivers or large lakes such as Lough Gowna, Lough Oughter, Lough Sillan, Upper Lough Erne, Lough McNean and Lough Ramor. Anglers in search of a secluded water will find many smaller lakes and river stretches and specimen hunters will find many rewarding waters. In West Cavan, the mighty River Shannon begins its journey from the Cuilcagh Mountains through the central plain of Ireland to the Atlantic Ocean. The Shannon’s main tributary, the River Inny flows from Lough Sheelin in the south of the County through the village of Finea. The upper reaches of River Erne, flow between the angling centres of Kilnaleck and Gowna. The river flows north from Lough Gowna and connects to the intricate lake system of Lough Oughter. The well known angling town of Arvagh lies near the source of the Cullies river system and continues through many well known lakes before joining Lough Oughter. 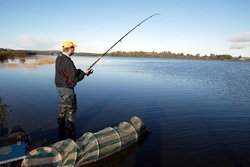 Cavan, Belturbet and Killeshandra are the angling centres near this popular fishery. The Erne is now joined by the River Annalee flowing in from the east, and near to the angling centres of Cootehill and Shercock. The main river exits Lough Oughter and continues in a northerly direction to Belturbet and on to Upper Lough Erne on the Cavan/Fermanagh border. Nearby is the River Finn and the attractive angling centre of Redhills. The Shannon Erne Waterway flows north east to the western shore of Upper Lough Erne. Associated with the waterway are the angling centres of Ballyconnell and Bawnboy. Blacklion in West Cavan is situated on the shores of Lough McNean Upper.